Officially my tapestry is called Maides Coign after the inscription that inspired it, referring to daughters as cornerstones. But I call her Gracie, after the supposed daughter of the man who remodelled East Riddlesden. Up until last Saturday everything was going so swimmingly I wondered what I would blog about. But that was before I began weaving the first of her hands. I really didn’t like the shape and initially assumed it was just tricky because it was at the selvedge and I wove it and rewove it at least three times before I realised the problem was not actually the shape, but the colour. It was that damned Ginger of Doom I had such trouble dyeing that was causing the problem – it was too orange and Gracie started to remind me of David Dickinson from Bargain Hunt and once I got that into my head it was not to be borne. 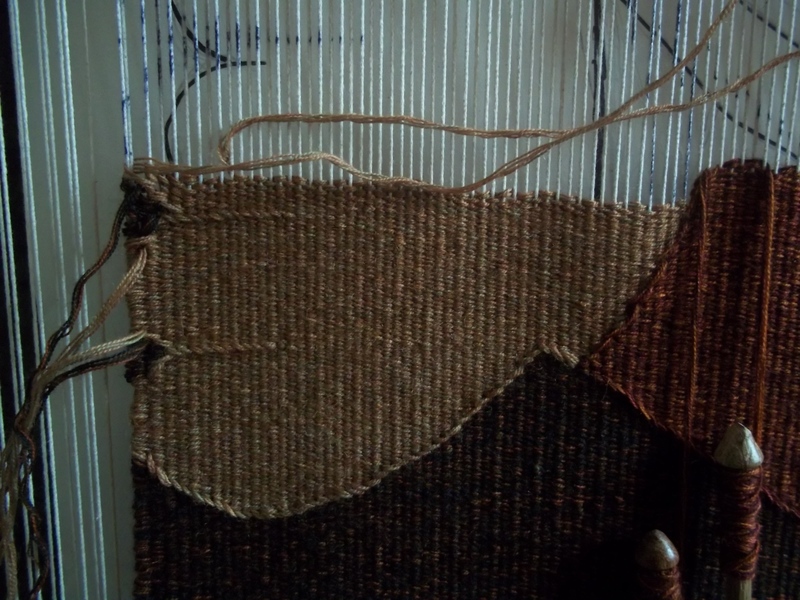 At first I tried softening it with other colours but it was only after weaving it another three or so times I realised the only thing to do was to ditch the ginger completely and weave some more colour samples from scratch. 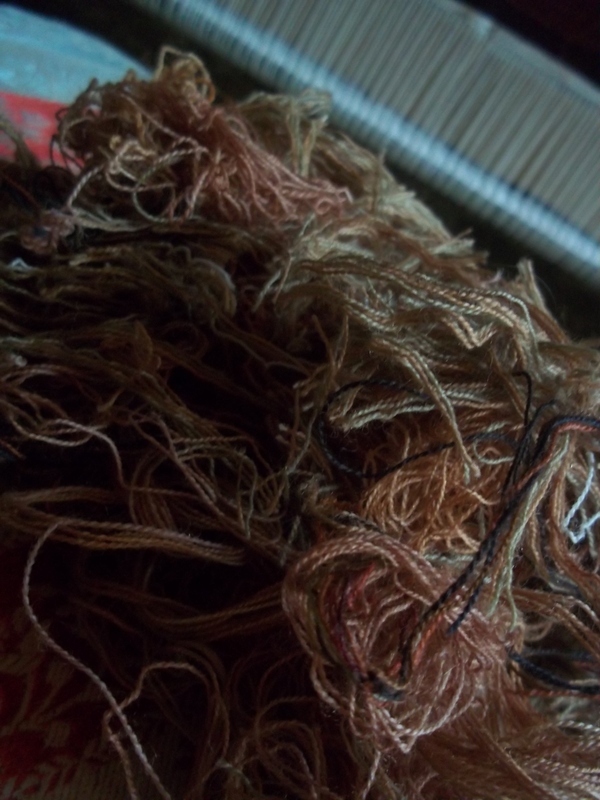 It was an incredibly frustrating time (you can see some of the wasted yarn from the unwoven hands above), and inevitably I began wondering if I even knew what I was doing. I didn’t help that I was so tired, having been working on the Hanging Tree in the evenings. We’ve also been open to the public this week and constantly dropping my bobbins to chat with the visitors meant I simply did not have the time or space to properly address the problem. Eventually I got there, but what should have taken a few hours, ended up taking five days. I am now behind and am working extra hard to catch up. I am learning to rope off my area when I need to focus and I have also done some FAQs to try to take the pressure off a bit. Needless to say the staff at East Riddlesden remain marvellously supportive and helpful. I am now very pleased with how she is turning out and we are becoming friends again. I can’t quite believe it is me who is making her. A fabulous sight one morning was a queue of ducks at the tea room door – apparently they were waiting for breakfast – I’ll try and get a photograph next time I see them. There are a pair of ducks I am particularly fond of – two male white ones that are never apart from one another. But it seems they too fell out and only one was seen this week, but yesterday there they were together again and seem to have made friends once more – sorry for the blurry pic – I was running for the bus! Been a couple of weeks since I posted but it’s been all go. 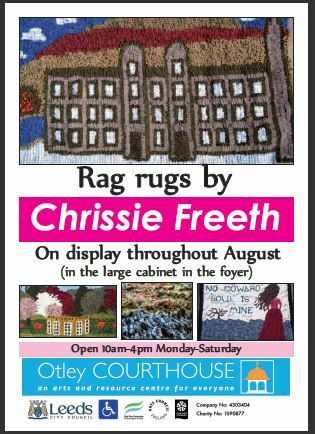 I was very proud to have been featured in UK Handmade and next week there’s a wee exhibition of my rugs at Otley Courthouse; I’ve been promised a pic or two and will share when I get them. 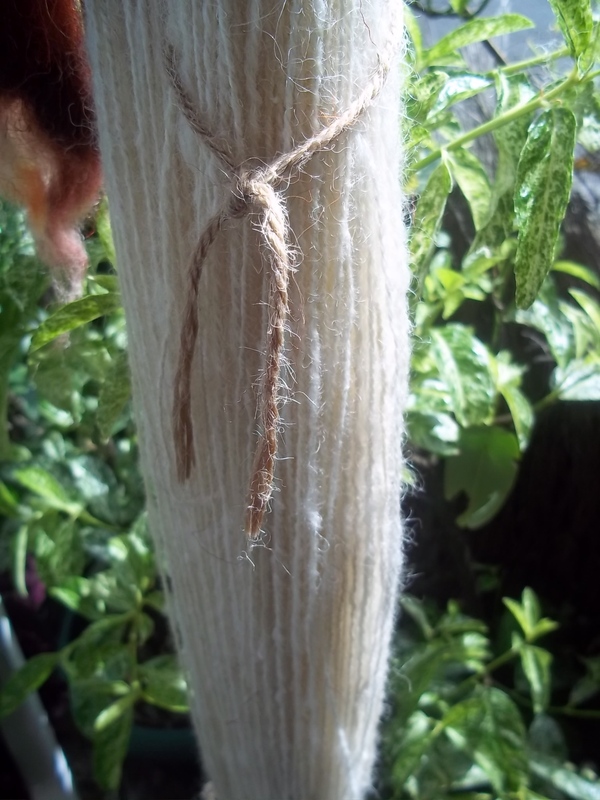 In the meantime I’ve been making merry in the odd minute of sunshine and have got some fleece washing done (a stunning Cotswold from a lovely Wiltshire breeder) and have been messing around with my dyes. It’s amazing what kitchen appliances and equipment one is willing to sacrifice for the cause. I’m afraid the state of my hob is a bit terrifying. 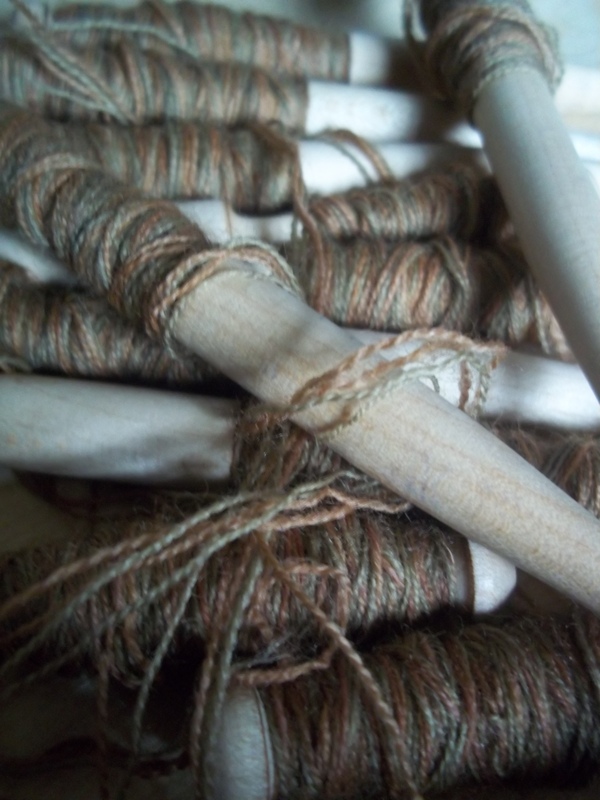 I’ve also been drying some of my handspun after I’ve fulled it. 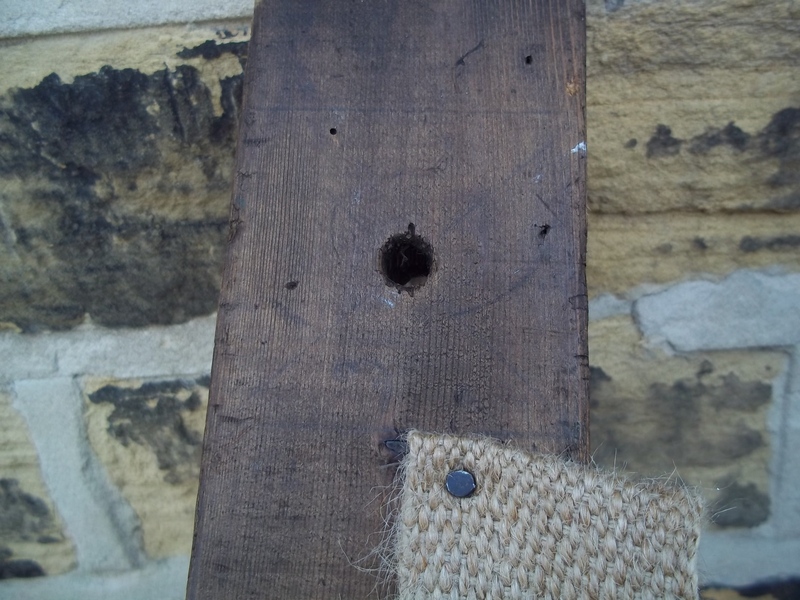 I’ve grown rather fond of thwacking it as hard as I can against the side of the house. I don’t know what my neighbours think of me but it’s great stress relief and the skeins appear super soft because of it. 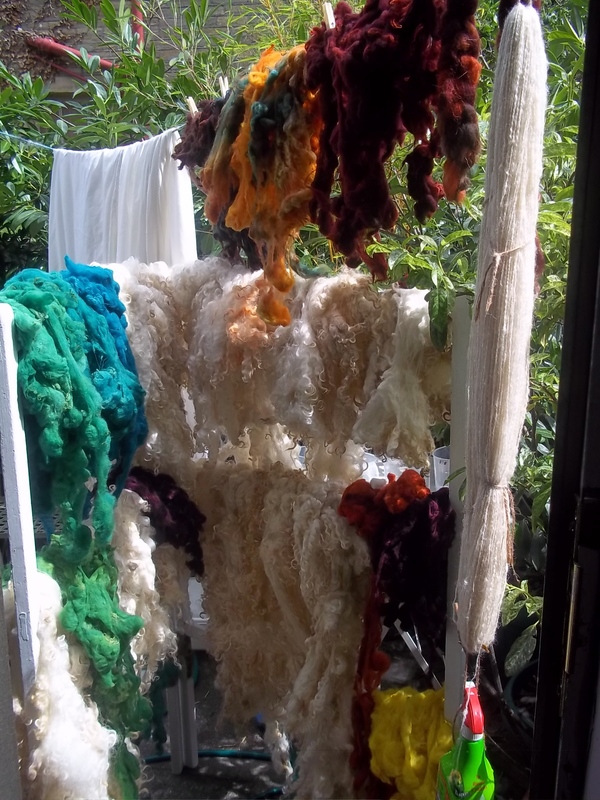 I’m building up a bit of a stash and I think I am going to dye it that deep wine colour at the top and I am, after writing this, going to try to design some sort of stole. My rather poorly ma is going on a cruise to Norway at the end of August and I thought I’d make her something to keep her warm in the evening. I doubt she ever reads this so I haven’t given the game away! 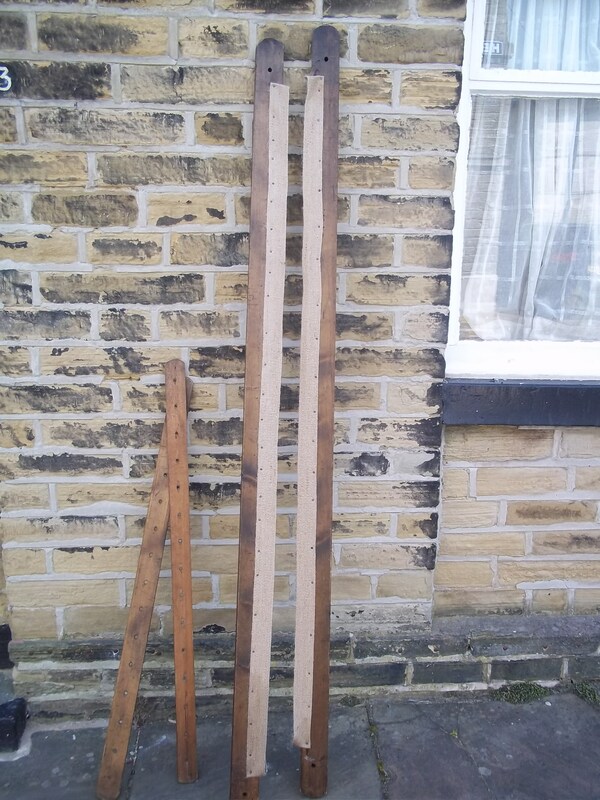 You may or may not remember these, the mat making frames that belonged to an elderly neighbour. 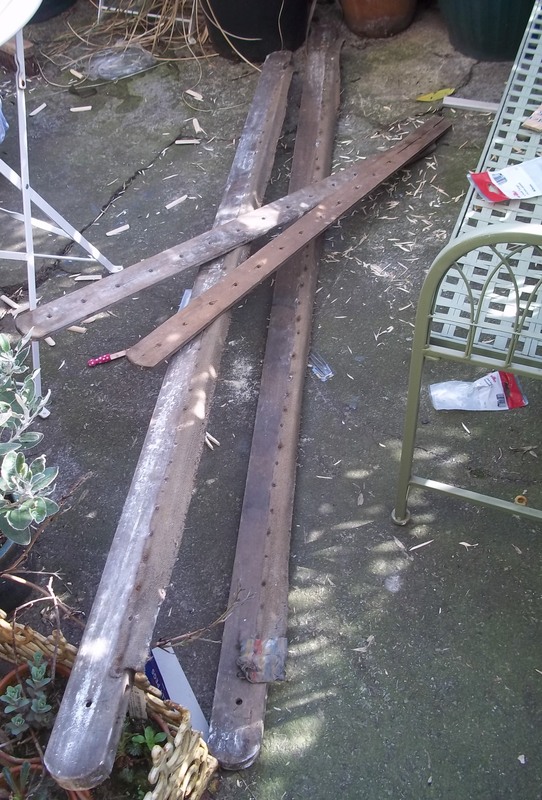 He saw me rug making in the garden and kindly offered to get them out of his cellar and lend them to me. They were made for his mother by his father in the 1930s and he remembered playing under them as a child and driving his mother crazy. Well, a bit of soap, gallons of wood worm killer, a liberal smattering of Danish Oil, a new length of upholstery webbing and voila! 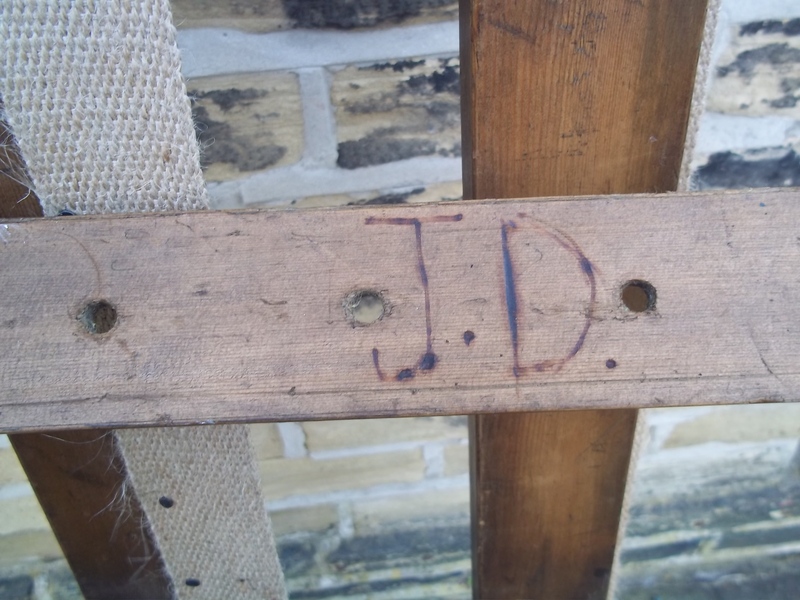 The wood is utterly lovely and there are some intriguing tell-tale signs of their previous owners, including the pencil lines drawn sixty/seventy years ago by Jim’s father as he made them, and the initials JD. Apparently Jim’s mother liked putting initials on everything using the end of a hot poker from the fire. There is a bit of confusion about who these initials actually belong to as they are more likely to belong to his grandmother Jenny. It is just a little bit fab knowing the names of the ladies who used these frames before me – Nora and Jenny. They are 7 foot plus and took up the width of their living room in both Caroline Street and Mary Street here in Saltaire. They are too big for my little workroom so I will be setting them up in my own living room, just got to decide what to make! After a very busy and highly enjoyable three days helping Chrissie Freeth run her rag rug stand at Saltaire Makers’ Fair, I finally have a chance to sit down and write something about the wonderful people we met who came to see Chrissie’s rug making demonstration. Some 2000 people passed through Victoria Hall each day. 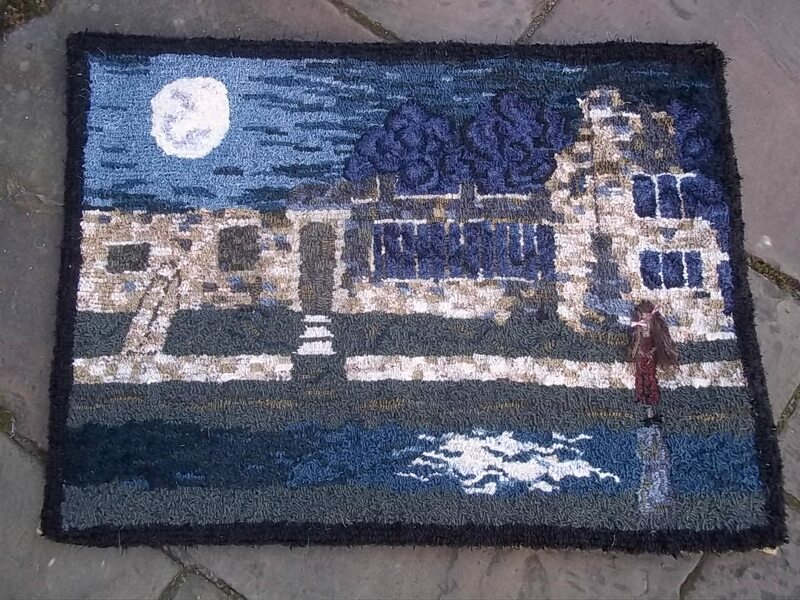 A good proportion of visitors had happy memories of rag rugs. They kindly shared these memories with us. The conversations usually started with the line “oh, my grandmother used to make these out of old coats!” Many of these people were now grandparents themselves, often with grandchildren in tow. One gentleman, now in his 70s, was visiting the fair with his daughter and her two daughters. 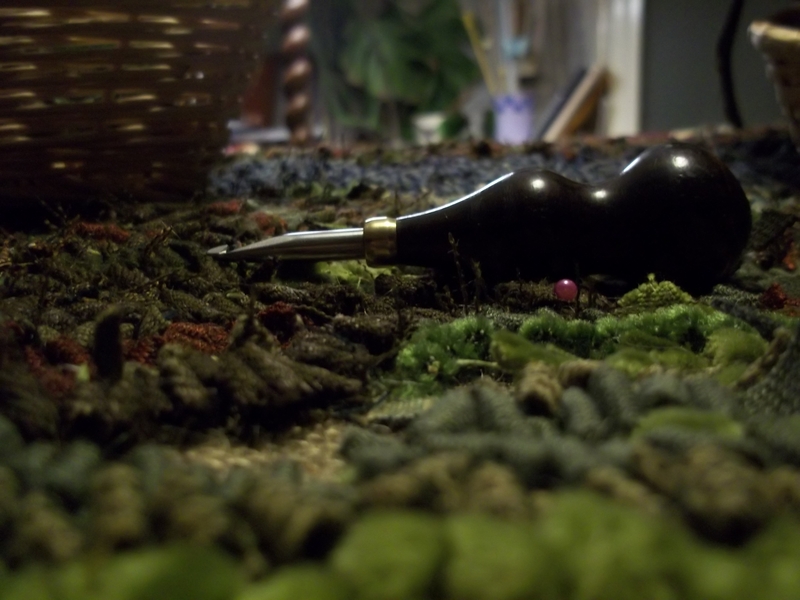 The gentleman used to help his grandmother make rag rugs as they did not have carpets. He had very fond memories of sitting with her on winter nights clipping up old clothes for her. He watched on as his own two grand-daughters, aged 7 and 8, had a go at making a proddy rug with Chrissie. They were naturals and had to be persuaded to let other children have a go. One of the nicest things to see over the weekend was the happy memories that Chrissie’s rugs bought back. One lady, in her 80s, told us that her father was not really interested in her and her sisters. The only time he spent with them was in the evenings when they helped him as he sat at his frame and made rag rugs for the family home. This was a really happy memory for her. 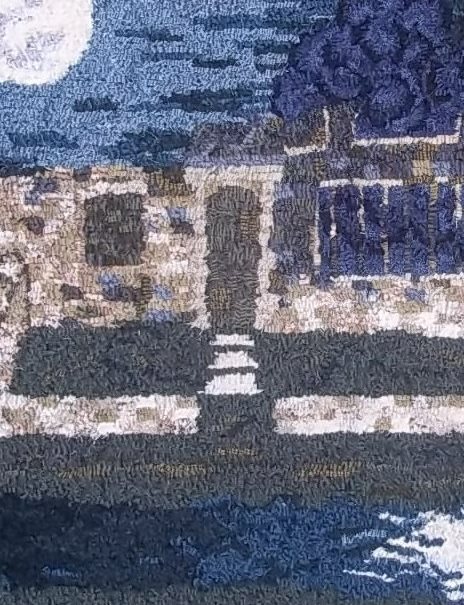 A couple who married in the early 1950s told me that their mothers had made them rag rugs for them as gifts for them when they set up their first home. They are still together fifty years later. Sadly the rag rugs were lost when their kitchen flooded. They said the rugs soaked up most of the water – and they were so heavy it took two people to lift them! Another lady told us how her and her mother used to sit in the kitchen and make rag rugs together. The kitchen floor was covered with rag rugs too. Her father used to mend clocks and watches. Apparently it caused great consternation when a tiny cog got lost in the thick pile of the rag rug. She laughed as she described her parents crawling around on the rugs, trying to find the errant machine part. A common theme throughout the memories that people kindly shared with me is one of being poor and having to make do with whatever materials were available. 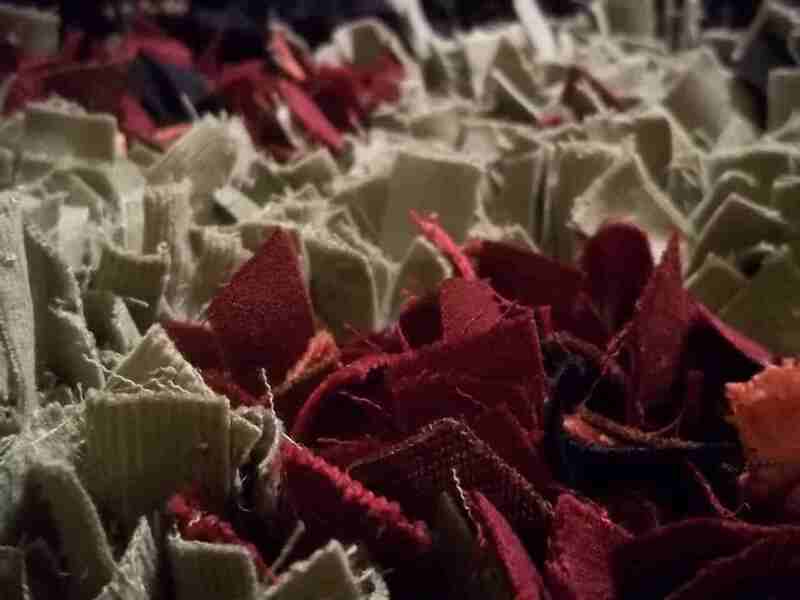 Despite the memories being associated with not having much, everyone had happy memories, as often the making of rag rugs was done as a family, with each person having their own task to do. Rag rugging was not just mum’s work – fathers were involved in making the rugs too. We noticed that there was huge variation in what people called rag rugs. 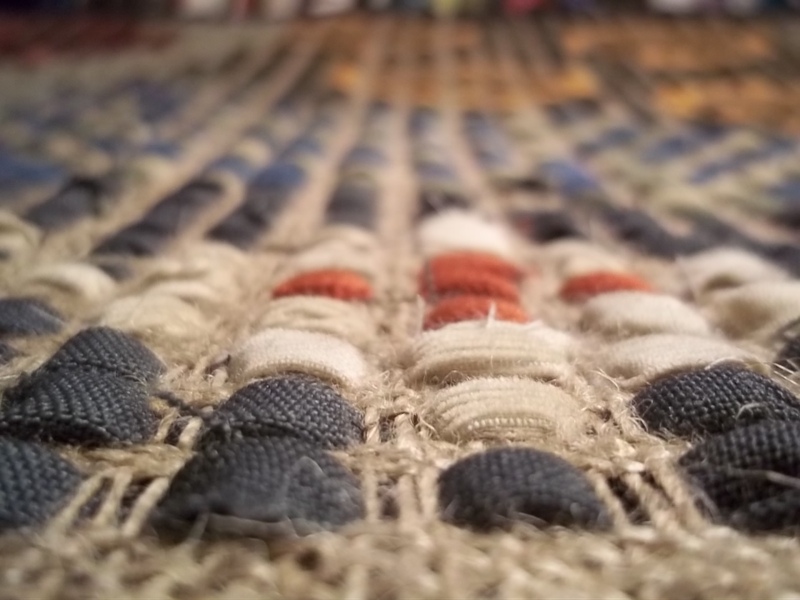 They were proggy mats or peg rugs in Newcastle, bit rugs in Huddersfield, clip rugs in Lincolnshire, tatty rugs in Edinburgh and peggy rugs, tabbed rubs, rags rugs or list rugs in various parts of Yorkshire. We had some inspiring moments in our three days at the Makers Fair. One lady sat down to have a go at the proddy technique, despite being registered blind. She picked up the technique instantly and bought one of Chrissie’s rag rug starter kits. She is hoping to make her own rug. Another wonderful moment for us was meeting a lady who has both little fingers missing. We asked her if she wanted to have a go at making the rug, she was hesitant, but gave it a go anyway. She picked up the prodder and mastered the technique straight away. 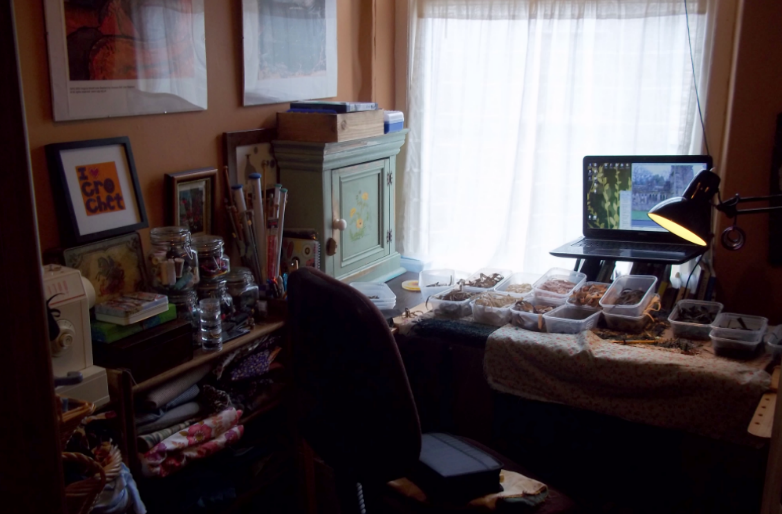 She was delighted to discover something she could do that could be a creative outlet – something she didn’t think was possible before. Although one of the best things about our time at the Saltaire Arts Trail was hearing these memories, it was also one of the saddest; in a few generations they will be gone forever. But fingers-crossed many new rag ruggers were made that weekend, and Emma was one of them! A couple more rag rugs just snipped from the frame, actually the first one I finished last week but the ground has been too wet outside to photograph it. I am a big Bloomsbury fan and have always loved Vanessa Bell’s design for her sister Virginia Woolf’s posthumous book, A Writer’s Diary. Proddy rugs are not noted for being too accommodating when it comes to design but I am rather pleased with how it turned out. Although I do enjoy making proddys, they are severely depleting my fabric stash. The cream background is nearly four metres worth! This one is another flower proddy and I have to say it is my favourite so far. Some of the fabric in this one is so soft and lush. This will be going on sale at the Arts Trail although if anyone buys it I will be utterly heartbroken. I haven’t sorted the edges and backing yet, just tucked it in underneath which is why it looks a bit funny in the corner. Not the best piccie and for that I apologise – it is too cold to go outside for better light; but at least these flowers are faring better than my seedlings caught in the late snow last week. These proddy brooches are made from some stunning quality scarves that recently came my way and some lush woollen blankets from my stash. I raided my grandmother’s old button tin for the centres. The clips are around 3 cm long and 3/4 an inch wide and cut to shape. 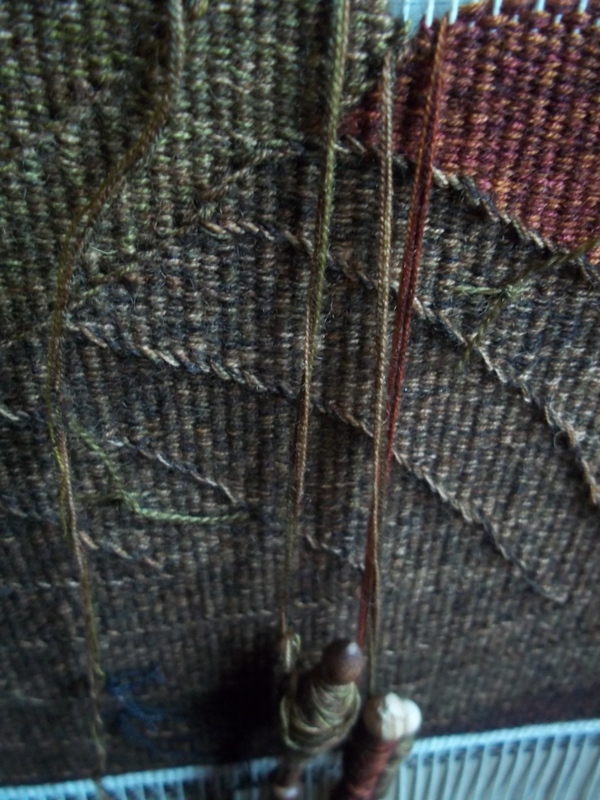 The photograph below shows one of the brooches just about to be cut from the hessian backing. I hem the circle and draw a ‘bullseye’ to guide the clips. I recently got my own bodger (Brown’s ?) and although it was in a sorry way, after a few taps with a hammer, a bit of WD40 and some sandpaper and elbow grease it was in tip-top condition again. I’m not normally a fan of using a bodger, I much prefer to work proddy mats the traditional way from the back; although I got used to it in the end, I don’t think I would use it for larger projects. 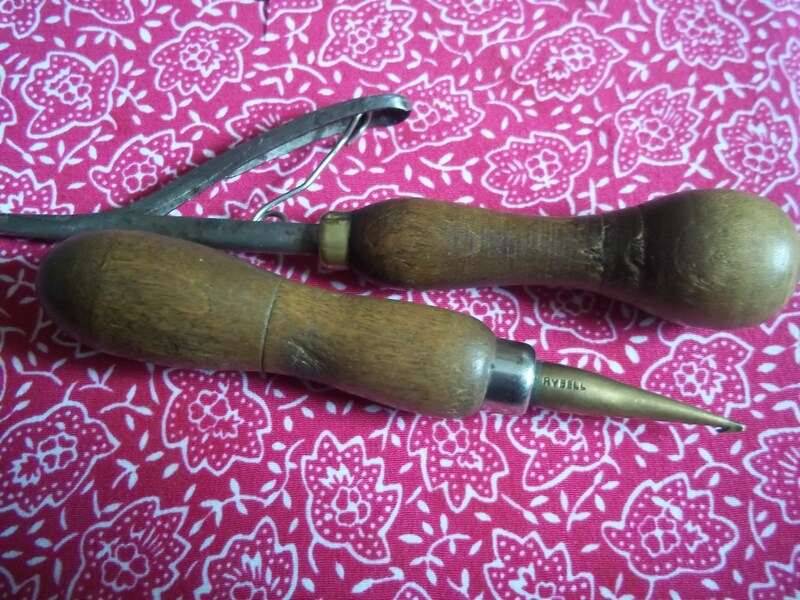 The bodger was from ebay and in amongst the job lot of rug making stuff was also a brass hook; the shank was stamped “RY BELL” and I was thrilled to realise it was one of the hooks made by John William Bell who was born in 1882 in Sunderland and who is mentioned in “From Rags to Riches: North Country Rag Rugs” written by the senior keeper at Beamish Open Air Museum, Rosemary Allan. Presumably the RY refers to the Ryhope Colliery where he worked as a blacksmith. I was ever so slightly thrilled! As well as these vases of brooches there’s also a basket full of them. I just need to do some labels and they will be ready for the Arts Trail. This rug is based on Wycoller, a once deserted hamlet in the Yorkshire moors and now a country park. It has no through road, just a beck; I heard about a farmer’s daughter in the early 1900s who crossed one of its seven bridges and tripped in the ruts caused by centuries of footfall by the weavers’ clogs; she died and her distraught father chiselled the bridge flat. I plumped for the bridge made of two large slabs of stone in front of the ruined Wycoller Hall, but have since been told she died further along the beck – arh well! 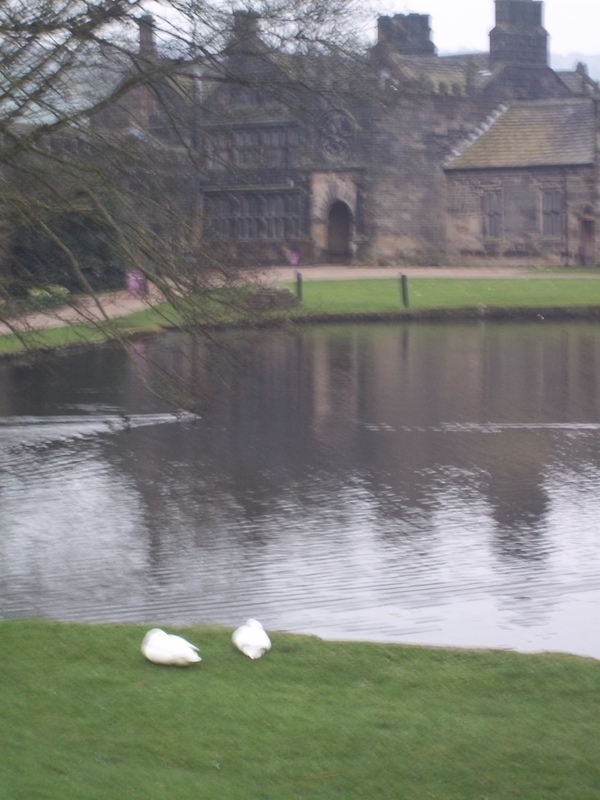 The hall, by the way, is supposed to be the inspiration for Ferndean Manor in Charlotte Bronte’s Jane Eyre. I decided to go for moonlit scene; Wycoller is infested with ghost stories and myths including a storm-induced headless horseman. I thought a night scene would fit in well, and perhaps bring a sense of quiet, stillness and loneliness. It did make the rug rather hard work though, it has to be said. I am a great fan of Atkinson Grimshaw and so I wanted that green-blue kinda sky he does. It means the treeshad to be blue, but I think they have a omnious billowing presence hovering in the background and amongst the ruins. The beck is done in the same colours as the sky, but without the lighter blue. There were four blues for the sky and another nine or so for the trees. I found the food storage tubs sold by Wilkinsons ideal for storing the strips of thread and they were easily stackable when a particular colour was not in use (and provide a fabulous excuse to show off my new cupboard in my workroom!). To keep the blues of the sky and the blues of the tress distinguishable I put a safety-pin in with the tree colours and so with a quick rattle I knew what I was reaching for. The stonework is made of a dozen or so creams, whites, tans and golds, as well as four or five greys for the soot coloured stone. The wall is the same, although without the greys. The moon and its reflection is in a single bright white with a bit of sparkly glittery fabric thrown in here and there from one of my mum’s evening dresses! My initial design also included the double arched pack-horse bridge, but it would have made the rug too busy, and would have detracted from the girl. It was very important to me to get the doorway right. The last time I was at Wycoller my companion – an entirely sensible, scientific and non-religious friend – became exceedingly uneasy at that doorway, so much so we had to leave. I don’t believe in ghosts or spirits and neither does my friend, but his reaction was very real. Initially I thought I would do the beck brown, but it seemed better to keep the colours limited to blue and green to help focus on the girl. Her dress was the first thing I hooked. 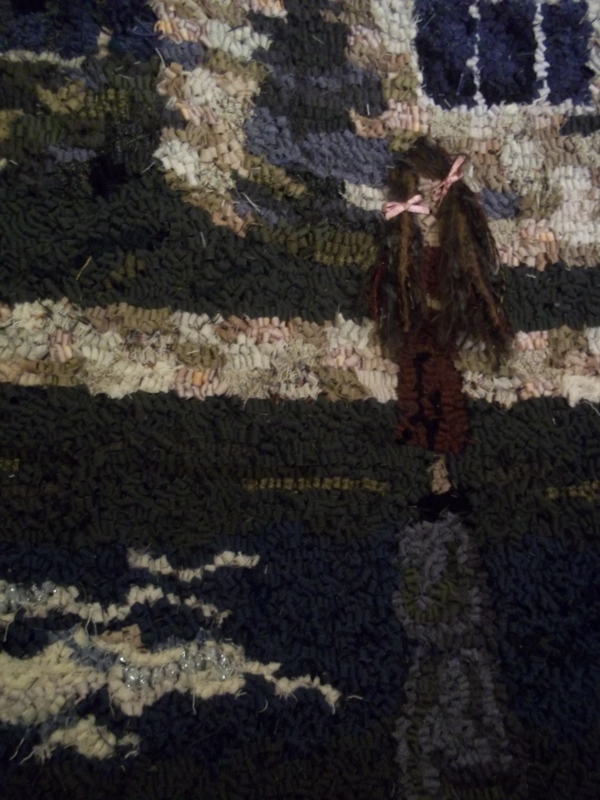 I hadn’t really thought about her face and hair until towards the end when I thought to latch-hook her hair in various yarns to make a 3D effect, and am very pleased with the result. I only had pink ribbon thin enough and think I will replace it with red eventually. This rug kinda gives me the heebie jeebies, which I suppose is a good thing.